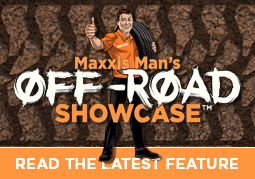 Hello again, from me the Maxxis Man. As you’ll probably know by now, I’m getting right into the holiday mood and hoping you’re beginning to feel it too! Our next road trip takes us to Tassie, renowned for its homegrown and organic foods, superb local wine and breweries, rugged landscapes, fresh air … and the list goes on. What better way to spend a week (or more) than doing some exploring of this amazing “Apple Isle” (as it is called). We’ll be doing a full circle starting and finishing in Hobart and covering over 1,200km (even more if you’re up for some detours!) So, fill up your tank, do that check of your vehicle (remembering to inflate those tyres while they are still cool) and let’s get on our way! 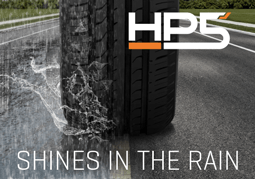 A large touring SUV (Ford Territory, Toyota Kluger or similar) fitted with Maxxis HT770 Bravo tyres would be a great choice for this round trip, providing plenty of space and an exceptionally comfortable and stable ride! We’ll be starting and finishing in Tassie’s Waterfront capital city, Hobart. After setting off, the first leg is to Freycinet National Park, and then on to Launceston. From here we’ll head to Stanley, wind our way to Cradle Mountain, Strahan and then finally back to Hobart (with lots of stops along the way). Six days is a popular timeframe for a Circle Tasmania road trip – allow at least a day or two in each destination. 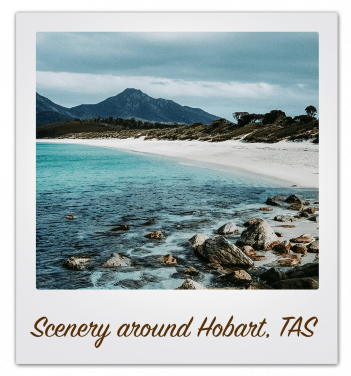 Although the locations on our itinerary are generally not more than four hours apart if you travel directly, give yourself time to enjoy the best of Hobart’s restaurant and arts and culture scene, visit local wineries, fruit farms, wildlife sanctuaries (you have to see a Tassie Devil! ), do a walking-track or two through national parkland and breathe in the wilderness landscapes that Tassie is so famous for. 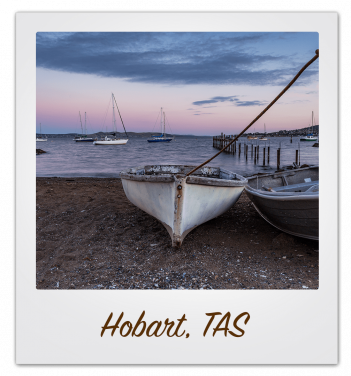 From Hobart follow the Tasman Highway (A3) to Swansea (134km), and onwards – soaking up stunning coastal views over Great Oyster Bay to the magnificent Freycinet National Park. Kate’s Berry farm (renowned for its cool climate berries, jams and berry wines) – is a great place to stop and recharge. A 45-minute drive on from Swansea (past a few wine cellar doors!) finds you at the national park and Wineglass Bay with its pink granite mountains (the Hazards) – and the walk to Wineglass Bay Lookout (about 40 minutes from the parking lot) is well worth the trek! This area is home to picture-perfect beaches, walking trails and the Freycinet Marine Farm where you can fill up on delicious local seafood (eat in or takeaway!). A small detour to neighbouring seaside town Bicheno offers some great wildlife experiences including your chance to meet up with Tassie Devils on a “Devils in the Dark” tour, in their natural habitat. There are heaps of accommodation options in the area — lodges, hotels, cottages, caravan parks and (powered and unpowered) campsites – it’s your call! Three hours on from here gets you to Stanley (in the region often referred to as the “Edge of the World”) and home to Tassie’s famous Leatherwood honey as well as the Nut chairlift (named because it looks over a volcanic outcrop known as “The Nut”). 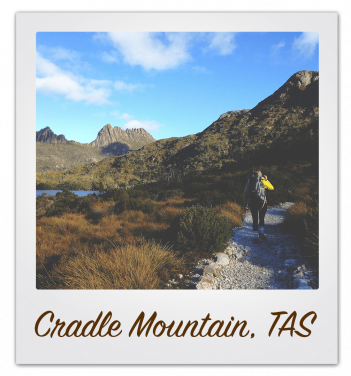 This is a great place to spend the night and explore before winding your way to Heritage listed Cradle Mountain wilderness area and famous Overland Track. It’s an area of vast rainforests, mountains, streams and lakes (this place has it all!) Set up camp for a few days (or book in somewhere for a bit more luxury) and relax, walk, fish, go wildlife spotting – or put your feet up and enjoy the picturesque panorama stretching for miles in every direction. Another scenic drive takes us through Queenstown (site of what was once the world’s richest gold and copper mine) and onto Strahan, a pretty waterfront location to stop for a meal or spend the night. There is a village hotel and other accommodation options. Now we’re on the final stretch back to Hobart — but the trip’s not quite over yet, with 4 hours on the road still to go. Taking the Lyell Highway, stop for a break in quaint Tarraleah, with its history dating back to Australia’s first hydro-electric schemes, with restored original cottages from this time. Take a detour through Mt Field National Park (part of the World Heritage area) and be sure to do the 20-minute boardwalk to Russell Falls surrounded by tree ferns (it’s an incredible sight)! Swimming gear is a must, as are good walking shoes, fishing equipment and camping supplies. Tassie can be cool even in summer (with breezes coming off the Bass Strait and other oceans) – so as Mum always says, take a jumper! Be sure to leave some space for a box or two of great Tasmanian wine from the cellar doors along the way. Pheewww! Well we’ve put in a few km’s, seen so much and really put those tyres to the test! It’s been a pleasure having you along for the ride – hope you’ve had as much of a good time as I have. Looking forward to hearing about your Tassie adventure (please drop us a line about where you stopped and stayed and any special sights you’d like to share with other travellers). From myself, the Maxxis Man and the rest of the team, it’s cheers and safe travelling until next time! Please note: The information offered in this blog is of a general nature only and should in no respect replace detailed research, travel and safety preparations as relevant to your individual requirements and vehicle.